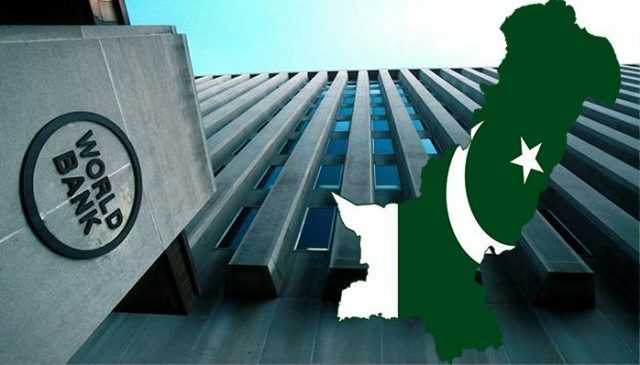 LAHORE: A report released by the World Bank on Saturday projected Pakistan’s remittances growth to remain moderate at 6.2% due to significant reductions in inflows from Saudi Arabia. The country was ranked 7th amongst the top ten recipients of remittances globally in 2018 receiving $20.9 billion and with India ranked at 1st with $79.5 billion. In South Asia, Pakistan was ranked 2nd behind India which bagged the 1st position for remittances. According to WB, employment opportunities contracted in the Gulf Cooperation Council (GCC) countries contracted in 2017 and 2018, mostly in Saudi Arabia because of nationalization policies, as highlighted by lower deployments in Pakistan (-26% during January–August 2018 and 41% in 2017). It added that South Asia had the lowest average remittance costs in any world region at 5.4% in the 3rd quarter of 2018. 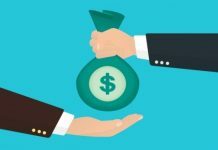 However, the Washington-based lender indicated this was a touch higher than the 5.2% percent costs recorded in the previous quarter and a reversal of the steady declines seen since the second quarter of 2017. Also, the report said in Pakistan, the number of workers registered for overseas employment dropped by 41% (0.83 million in 2016 to 0.5 million in 2017). Pakistan’s remittances as a percentage of GDP was 6.9% in 2018, ranked at 3rd behind Nepal at 30.1% and two positions above India at 2.8%. The remittances to South Asia are forecast to grow by 13.5% to $132 billion in 2018, a healthier rise than the 5.7% recorded in 2017. The upsurge is fueled by stronger economic in advanced economies, especially the United States and the rise in oil prices having a positive impact on outflows from some GCC countries, such as the United Arab Emirates which reported a 13% growth in outflows for the first half of 2018. 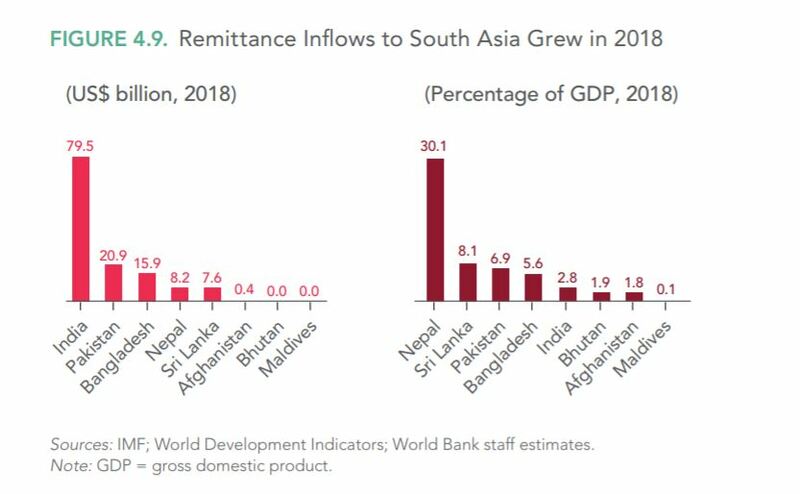 Remittances to South Asia are projected to slow down to 4.3% in 2019 because of the moderation of growth in high-income countries and slower migration to GCC countries. WB projects that officially recorded remittances to developing countries would grow by 10.8% to $258 billion in 2018. Global remittances which include inflows to high-income countries are estimated to rise by 10.3% to $689 billion, said WB. Remittance inflows to South Asia registered a growth of 13.5%, in Europe and Central 20%, Sub-Saharan Africa 9.8%, Latin America and the Caribbean 9.3%, East Asia and the Pacific 6.6%, Middle East and North Africa 9.1% respectively. Moreover, the WB stated this growth was fueled by a stronger economy and employment situation in the United States and a rebound in outward flows from Gulf Cooperation Council (GCC) countries and the Russian Federation. And as global growth is forecast to moderate, future remittances to low and middle-income countries are projected to rise modestly by 4% to touch $549 billion in 2019. For 2019, WB stated global remittances are forecast to increase 3.7% to $715 billion in 2019. The report highlighted that the global average cost of sending $200 remains high at 6.9% in the third quarter of 2018. “Reducing remittance costs to 3% by 2030 is a global target under Sustainable Development Goal (SDG) 10.7. 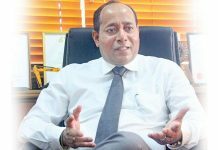 Increasing the volume of remittances is also a global goal under the proposals for raising financing for the SDGs,” said WB. 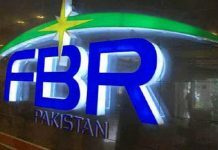 According to official data released by State Bank of Pakistan (SBP), overseas Pakistani workers remitted $7.419 billion in the first four months (July to October) of the financial year 2018-19 (FY19), as compared to $6.44 billion received during the same period last year. During October 2018, the inflow of worker’s remittances amounted to $2.0 billion, which is 37.7 per cent higher than September 2018 and 20.9 per cent higher than October 2017.